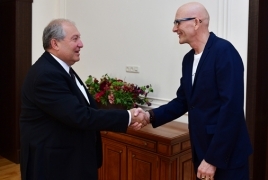 PanARMENIAN.Net - Armenian President Armen Sarkissian on Thursday, September 6 hosted prominent Swedish economist, Professor at the Institute of International Business (IIB) at the Stockholm School of Economics Kjell A. Nordström. At the meeting in Yerevan, the two exchanged thoughts over global trends of economic development, geopolitical transformation, the process of making nations in the new world more competitive and other issues. Nordström and Swedish author Jonas Ridderstråle work as professional public speakers in the field of strategic management.The 2005 Thinkers 50, the bi-annual global ranking of management thinkers, ranked Nordström and Ridderstråle at number nine internationally and number one in Europe.